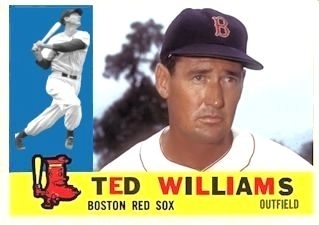 ON THIS DATE (September 28, 1960) ... Ted Williams, one of the most fabulous figures who ever swung a bat, ended his brilliant, stormy and spectacular baseball career at Fenway Park yesterday by blasting the 521st home run of his life into the center field bleachers. When the game was over, Manager Mike Higgins announced that Ted would not go to New York with the club for the final three games of the season in Yankee Stadium. So, the 10,454 paying customers saw Ted bow out in fitting and typical fashion. The homer had left the Sox one run in arrears. The fans didn’t care about the score. They wanted Ted, whose homer came with one out. The Sox came out for the ninth and there was another roar. For Williams jogged out to left field. He took his position for about two minutes amidst wild shouting. When it had subsided, Higgins sent Carroll Hardy out to take Ted’s place. As Williams headed toward the dugout, he received one of the warmest receptions of his life. Everyone stood and cheered. Players in the bullpens and dugouts. Mrs. Tom Yawkey and the returning Jackie Jensen up in the sky view seats. There was many a moist eye. If Ted didn’t get a charge out of it, he isn’t human. This was the happy ending Williams’ followers wanted. This was the way Ted wanted to bow out. He narrowly missed a homer in the fifth when he backed Al Pilarcik against the visiting bullpen for a putout. This was the way Ted wanted to bow out. 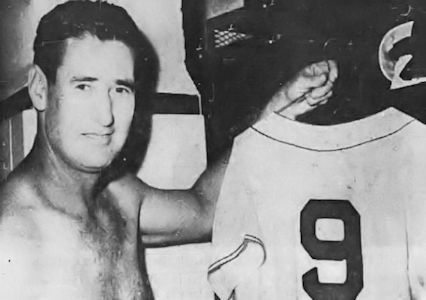 When the American League race opened in Washington on April 18, Ted hit a tape measure homer off Camilo Pascual in his first time at bat. This started him toward a hitting spree for a 42-year-older. He his 29 homers. He batted .316. He not only reached the 500 mark in homers but he passed the late Mel Ott (508) as the third lifetime all time home run hitter. His total of 521 is only 13 behind Jimmy Foxx, the runner up to Ruth, who hit 711 out of the park. In his first game in the American League, his best belt was a two-bagger. That was at age 20. There’s one thing you can say about Ted, without fear or contradiction. Like good win, he improved with age. The dramatic home run put the Sox one run down to the Orioles 4-3 in the eighth inning. In the ninth, the Orioles fumbled away the game. Marlan Coughtry singled for the Sox and was followed by Vic Wertz, who batted for Mike Fornieles. Wertz smacked a double to center. Jack Fisher then walked Pumpsie Green to load the bases. Willie Tasby hit a slow grounder to thirdbaseman Brooks Robinson who tried to turn the game-ending doubleplay, but secondbaseman Billy Klaus dropped the throw. Coughtry scored along with Tom Brewer who had run for Wertz. The Red Sox had come from behind to win. A footnote to a dramatic farewell.